I don’t know how our home turned into an ongoing science experiment. And not in that “Oh, look Mom, the leftovers from three weeks ago are moving” kind of way, but more in that “Gee, I wonder what happens if you put fire crackers in a four-month old pumpkin” kind of way. Maybe it’s because I live with men. I mean, I can understand the firecracker thing. It was New Year’s Eve and we were running out of things to blow up (which is also, technically, an entertainment source in our house) and so the guys looked around and saw a pumpkin. Now, I should probably explain that it had been there since September and was supposed to have been used in a praline pumpkin cheesecake, but somehow that didn’t happen and it ended up just sitting outside for three months. This in and of itself isn’t really all that unusual for our house either. We have a pretty substantial garden off of our porch that we fill with vegetables every year, but by around August I get kind of tired of picking everything and it gets hot, so the vegetables just sort of sit out there… Helps reduce the amount of planting you have to do the next year, though, I’ll tell you that. Anyway, so the pumpkin was sitting there and someone noticed it had a soft spot in it and said “Oh, hey… I wonder what would happen if we put a firecracker in there?” which they proceeded to do. What happens? The little soft spot in the pumpkin turns into a little hole, that’s what happens. 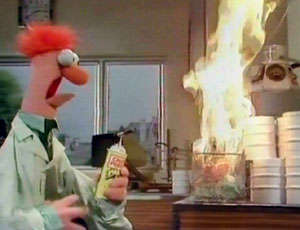 And then, since you can’t ever just do an experiment once, and you have to test your results, the little hole turns into a bigger hole, and a little bit bigger hole, until eventually someone gets the bright idea of putting four or five fire crackers in there, since it now has room, and the whole top of the pumpkin blows off. Which, of course, is when we discovered that smoke bombs inserted into a pumpkin with the top blown off look really cool cause the smoke comes up and sort of pours over the sides like bubbling wispy ooze. Who wouldn’t love to figure that out? The Pumpkin Fire Cracker Experiment, of course, led to the Great Fourth of July Fire Crackers in the Soda Bottle experiment, where the idea was to see what would happen if you put water-proof fire crackers in a almost empty 20-ounce plastic Mountain Dew bottle, put the cap back on and let the fire crackers explode. Result? With a muted snap-thud, the bottle jumps almost up to the ceiling of your porch causing outbursts of testosterone-fueled giggles and screams of “Dude, wait! Let me do it!” until someone doesn’t put the top back on all the way and sulfur-infused, firecracker debris-laden Mountain Dew leftovers spill all over someone. I guess some of that experimenting comes from me. I tend to be a little “creative” in the kitchen, and probably tend to wonder “what if” a little more than some … okay, a lot more. And some of it they get from their Dad, who is always interested in trying to figure out ways to blow things up or set things on fire or make them work faster or rework them to get them to work for him when other things don’t. As a matter of fact, Max, my youngest son, is outside right now trying to figure out how to make fire with two rocks since I took the lighter away from him. Maybe it’s inherited. So, I guess it shouldn’t surprise me that this year, we had tie-dyed Easter eggs. We hard-boiled them just like everyone else does, but then we cracked the shells and left them in the dye for about a million hours (okay, 30 minutes) until the dye had seeped into the white of the eggs. Despite the minimal risk of danger and the frequent messes, I kind of like the idea of our never-ending experiments. It’s not just about science, but about exploration and questioning and never being satisfied with the status quo. It’s about continuing to learn every day for the rest of our lives. It’s about expanding one’s boundaries and pushing the envelope – even if the envelope is a pumpkin. And I like that my sons are learning that. As long as they’re not questioning me. 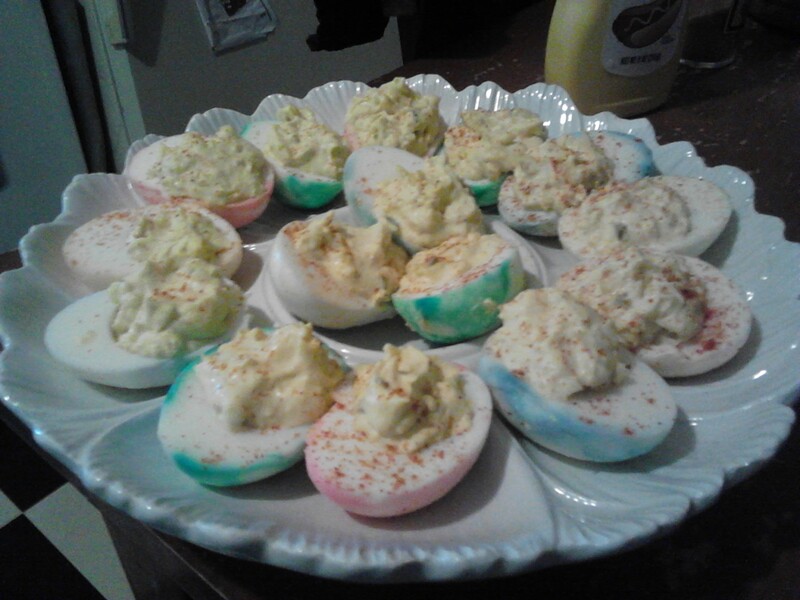 When he saw the tie-dyed deviled eggs at Easter dinner, Max asked if I was trying to poison him so I could steal his Peeps. I told him I wasn’t. They were still technically part of the Peep staleness experiment… duh.